Parasha Acharei Mot starts just after the death Aaron’s two sons (Lev 16:1). They had assumed that their roles as priests allowed them to do whatever they wanted in the temple, including the offering of a ‘strange fire’ which the Lord had not commanded. Consequently, a fire came down from the LORD and consumed them (Lev 10:2). In these circumstances the Lord spoke to Moses and gave instructions for how the priests were to draw near to the Holy God of Israel. The priest and the people are not to come into His presence in just any manner, but only after there has been sacrifice and atonement for sin. The instructions in the scriptures that follow are a prophetic picture of Jesus who comes to take the sins of the world. The story of Aaron’s two sons is analogous to the way in which many go about living their lives: we can too often prepare our approach to the Holiest of Holy places with an offering of the fire of our own works, expecting it to be satisfactory. Yet God has said that there is only one way to come before him and that is through the blood of Jesus. All too easily, we can assume we are doing what God wants, without having taken the time to get to know Him and His Holiness. We ought to be wary of offering our works upon the altar assuming that this is a good thing. The most common statement that comes to mind is, “if I’m a nice person and do good to others, then I’ll get into heaven.” But on the day when we stand before God offering a strange fire, a mixture of acts that superficially appear to be holy deeds may be revealed to never have been commanded by the Lord. Entering into the presence of God requires the cleansing blood of the Jesus: not through human efforts, but by divine atonement and repentance from dead works of self-righteousness. During the Day-of-Atonement the Nation of Israel pauses. All the stores close, the Jewish people fast and pray, religious and atheist alike. It is a day of reflecting on the past and looking to the hope of the future. Some Jewish traditions and stories say, that on this day God opens up the book of names and writes down all the deeds, good and bad. In this week all the Jewish people do their best to be extra kind to their neighbours and strangers in the hope that they will receive favour with God and He will write their name in the book. Yet, this is the tradition of men. 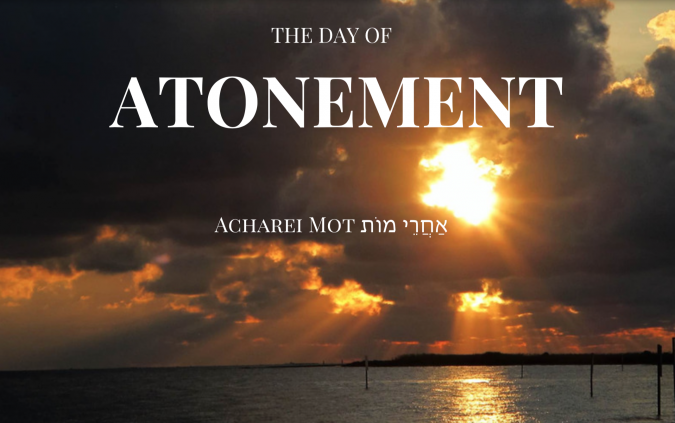 Let’s pray that through observance of the Day of Atonement, Jesus—the ultimate atonement for sin; the lamb who has taken away the sins of the world—will be revealed to the Nation of Israel.